Barbara J. Booth, 86, of Lexington, KY, formerly of South Hanford Ave. 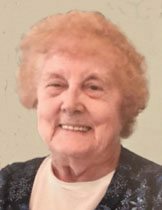 W.E., Jamestown, N.Y., passed away at 6:30 p.m. Wednesday, Nov. 15, 2017, in the Bluegrass Hospice Care Center, Lexington, KY.
A lifelong Jamestown area resident, she was born July 10, 1931, in Jamestown, N.Y., a daughter of the late Norman and Frances Byers Robinson. Barbara graduated from Celoron High School in 1948 and attended Jamestown Business College while completing her civil service exam. She was the widow of Walter A.D. Booth, whom she married Nov. 22, 1973, and who died Dec. 20, 1997. Before her retirement she was employed in multiply administrative assistant positions for the Southwestern Central School System for 47 years, working for various superintendents and business managers. She had also worked at the former Celoron School for Principal Charlie Brown and was the tax collector for the Southwestern Central School District for 25 years. Throughout her life she was an devoted volunteer for many civic organizations including the WCA Hospital Gift Shop, the WCA Hospital Women’s Auxiliary, the WCA Coffee Shop and the former Jamestown General Hospital Women’s Auxiliary and Coffee Shop. She was awarded a special volunteer pin for giving over 1,000 volunteer hours at both the WCA Hospital and Jamestown General Hospital. Her other volunteer organizations included the Little Theater of Jamestown, Meals on Wheels and the First Congregational Church Women’s Auxiliary and Diaconate. She was also an election inspector for Chautauqua County for many years. Surviving are a son, Jeffrey A. (Ann Leonard- House) House of Centerville, Ohio; two grandchildren: Elizabeth J. House and Thomas J. House both of Centerville; a sister, Alice Longwell of Hauppauge, N.Y., and a brother, Norman D. “Corky” Robinson of Indianapolis, Ind. ; as well as her nieces and nephews: Diana Longwell D’Amico, Charles Longwell, III, Amy Longwell Reynolds, Susan Longwell Candela, Laura Robinson and Christopher Robinson. Besides her parents she was preceded in death by her first husband, Thurman P. House; and a son, Thomas P. House, who both died on July 29, 1969. The funeral will be held at 1:30 p.m. Monday, Nov. 20, 2017, in the Lind Funeral Home. The Rev. Donald E. Ray, retired WCA Hospital chaplain, will officiate. Burial will be in the Sunset Hill Cemetery. Friends will be received for one hour prior to the service in the funeral home. The family requests that memorials may be made to the Thomas House Memorial Scholarship Fund, c/o the Southwestern Teachers Association, 600 Hunt Rd. Jamestown, NY 14701. You may leave a condolence to Barbara’s family at www.lindfuneralhome.com.